I can hardly believe it but this marks the last of my Pixar series! (Well, until Good Dinosaur comes out that is). 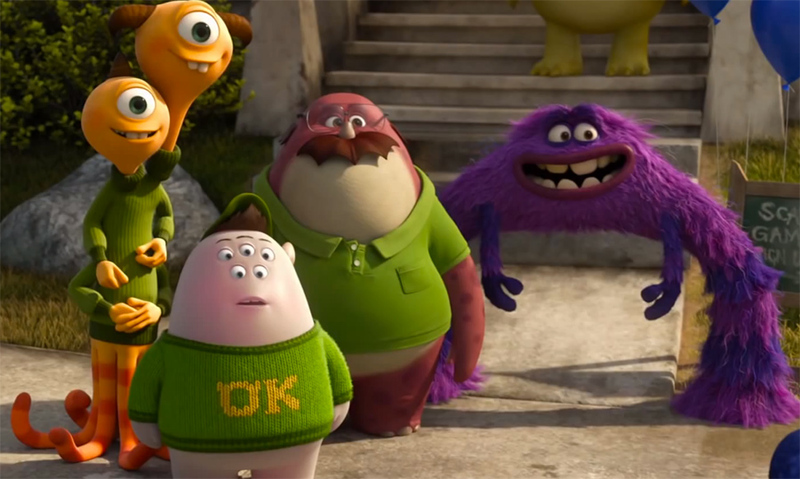 Today we will talk about Pixar’s 2013 effort Monsters University. 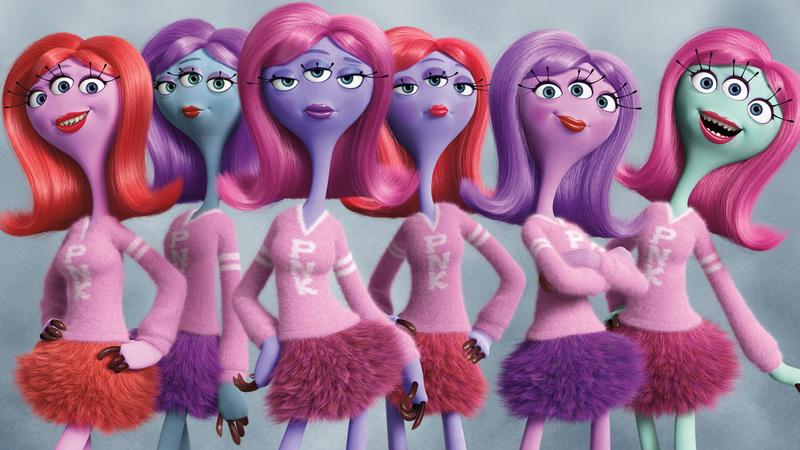 It is of course a prequel to the beloved Monsters Inc.
Pixar has a philosophy with sequels that in an effort to not repeat the same movie over again they try to not only tell a different story but put it in a completely different genre. If you think of the Toy Story movies all 3 are different genres (buddy movie, action adventure, prison escape). The same is true for the Cars movies (nostalgia small town story, spy movie). They followed this tradition with Monsters University creating a college comedy instead of the mixture of themes we get in original film. But right out of the gate they make an interesting choice. 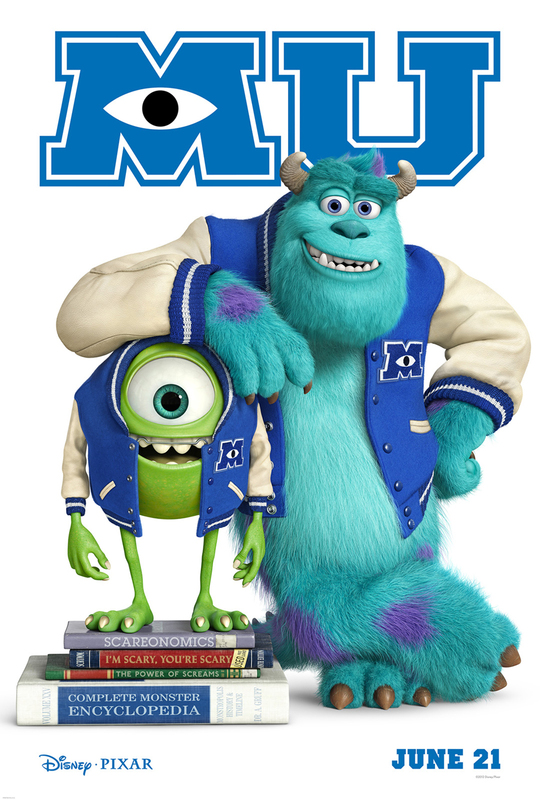 Instead of focusing on the hero and in many ways lead of Monsters Inc, Sulley, (he is the one with the relationship with Boo after all) they focus on the sidekick Mike. So how do you tell the sidekicks story? It’s a tricky thing. They start out with Mike as a little one going on a field trip to Monsters Inc. He is inspired by the scarers and decides that is going to be his dream job. He works hard and gets into Monsters University. He follows the mantra we’ve seen in a thousand other movies- if you work hard at something you will succeed. But wait! Pixar decides to subvert this narrative and give us something very unique for a kids film. 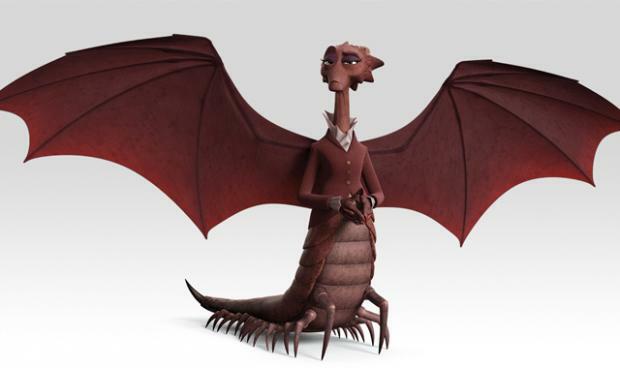 The head of the school is named Dean Hardscrabble voiced by Helen Mirren. She tells Mike he is not scary. She knows no matter how hard he works he will never be scary. In some ways she is the villain of the picture but in others there is no villain. There are just people being honest with Mike about who he is. 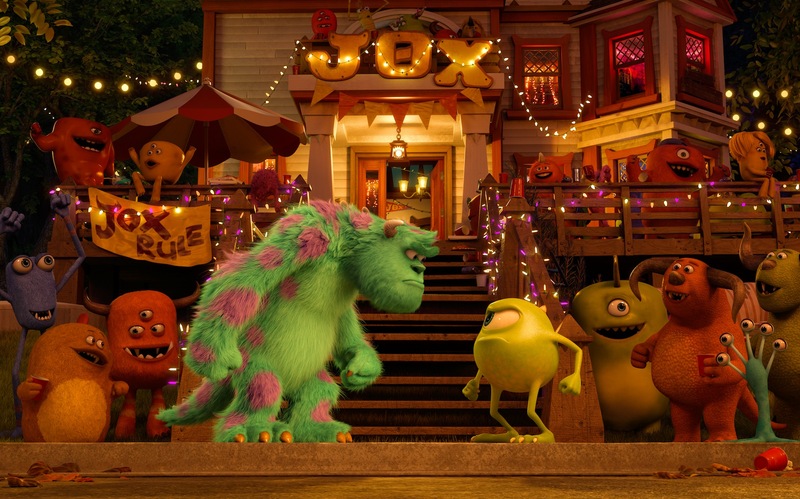 They also show an interesting dynamic between Sulley and Mike. Sulley is in many ways the exact opposite of Mike. Everything is easy for him. He is naturally scary and doesn’t have to work hard to be successful. 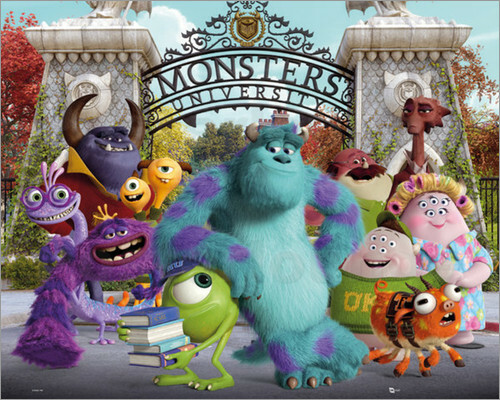 Mike has his head in books while Sulley doesn’t even bring a pencil to class. This causes animosity between the two at the start of the film. But then the annual Scare Games are announced and Mike see’s it as his opportunity to prove he can be a great scarer and be allowed into the scare program. In order to enter though he needs a fraternity and team. 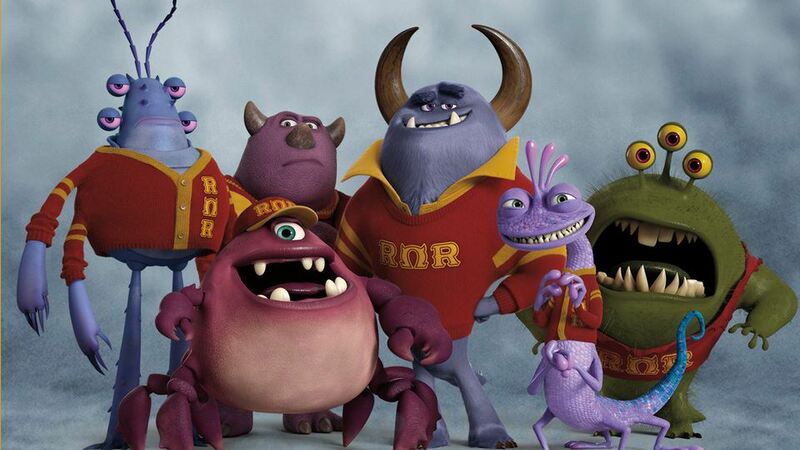 Sulley needs a team so he ends up joining Mike’s fraternity which he assembles from castaways and nerds. The opponents in the Scare Games is a fraternity called Roar Omega Roar. Nathan Fillion voices the leader of Roar frat. We also get to meet some of the other frats and sororities competing in the Scare Games. And that’s where we get into the goings-on of the Scare Games and the movie starts to lose me a little bit. The various obstacles and challenges (cheating and sabotages included) aren’t that compelling for me. And unfortunately it is a large part of the movie. Without spoiling it certain events happen that show Mike he is just not scary. His dream was wrong. That is a bold concept for a children’s movie to address. But what he does realize is he is a great coach, a great leader. He motivates everyone on his team to do better including Sulley. That is his true gift. In the end he is sad to give up the dream of scaring but he also seems happy to have found his true calling. I love that message and I think it makes Mike one of the most complex characters in all of Pixar. 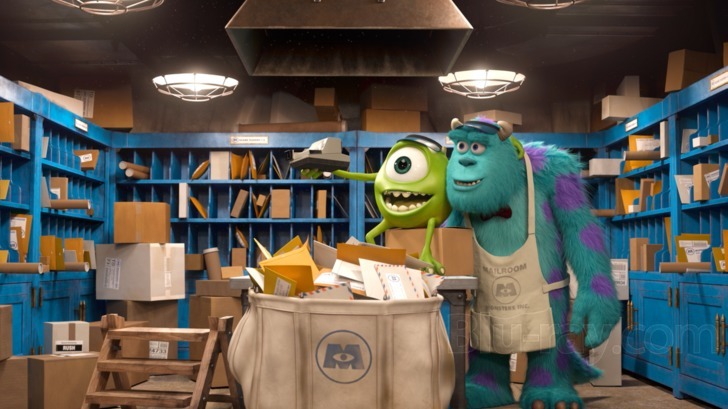 Mike and Sulley also realize they can get where they want by working through the company of Monsters Inc- starting in the mail room and eventually hitting the scare floor. That’s another very subversive message for a kids movie. You don’t necessarily need to go to college to get where you want to go. I love that! Monsters University also has a bright color palate that I find very pleasing. Animation-wise it is a joy to watch. All the voice cast is great including Billy Crystal, John Goodman, Helen Mirren, Nathan Fillion, Charlie Day, Aubrey Plaza, Julia Sweeney, Bonnie Hunt and more. 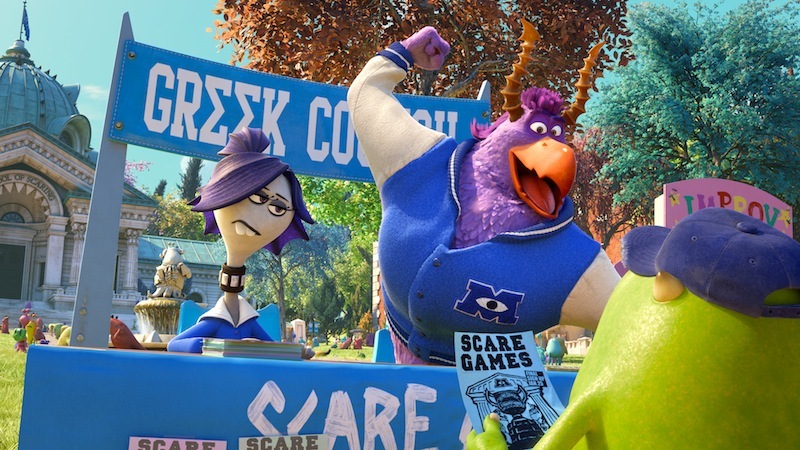 Overall, Monsters University is a very pleasant Pixar movie and one, like I said, that subverts traditional narrative quite a bit for the kind of story it is telling. I really enjoyed that aspect of it. It is creative, beautiful and I loved seeing Mike and Sulley’s back story. However, it is far from perfect. The Scare Games go on too long and I didn’t care much about them except for when the winners are declared. At 104 minutes it is a pretty long film and I think 15 minutes could have been cut without missing much of anything. Also the side characters aren’t that memorable or interesting. I didn’t hate them but just find them kind of forgettable. That said, I do like Monsters University. It challenges the traditional narrative just enough to keep my interest. I think if you watch it with your kids they will have a good time. There is some college partying gong on which some parents may be uncomfortable with and some tense moments to be aware of. Also I don’t know how interested little kids will be with Mike’s job struggles? Maybe I don’t know. Randy Newman returns with a lovely score. I was really impressed with how it sounded like a fight song from a University. It had that big band collegiate fight song feel to it. 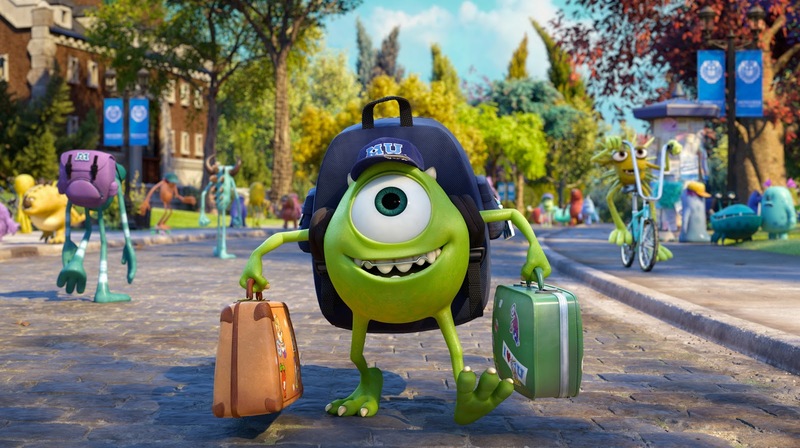 So Monsters University has it’s flaws but the uniqueness of Mike’s journey really rewards the viewer and makes you think about your dreams and life. Maybe there is something better for you instead of settling for mediocrity just because it is your dream? We are all good at different things but sometimes those talents take a little more digging for some than others. Mike discovers what makes him special and I love seeing that take place. 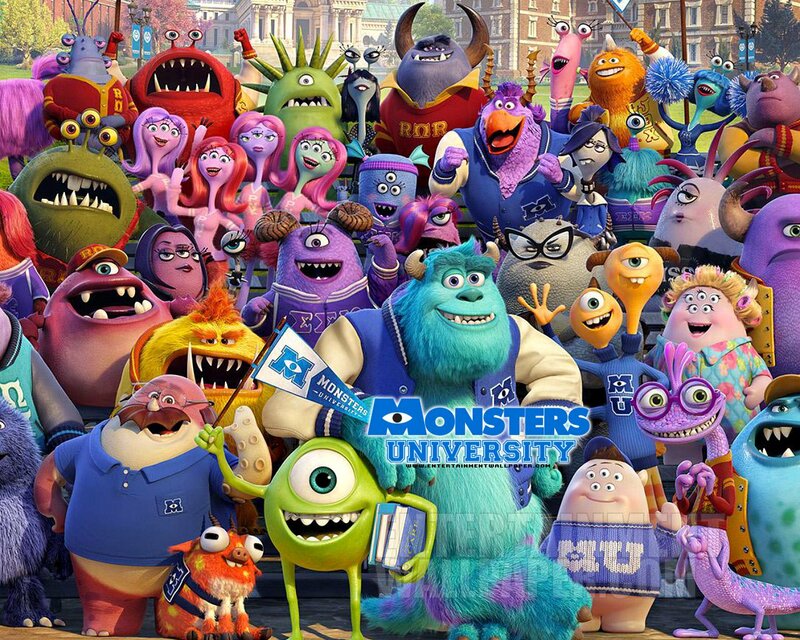 What do you think of Monsters University? That’s so awesome. I think it is underrated by most for sure. And its message really is unique in a kids film. That’s my favorite thing about it. I enjoyed the film, but I much would have preferred a sequel with adult Boo coming upon Monstropolis again or whatever the place is called. I probably would have maybe given this an A- for sure. I also like how it teaches kids that sometimes your dreams might be the wrong ones, you know? Obviously, that’s not to say that they sometimes aren’t, but still. 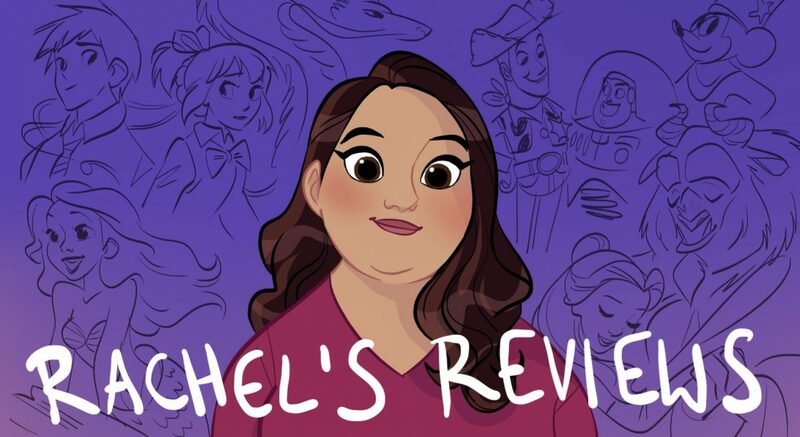 Oh, and I think that it should have been nominated for Best Animated Feature even though it probably wouldn’t have won for once (of course we know that every other Disney/Pixar film won Beat Animated Feature except for both Cars films and Monsters, Inc.). Anyway, great review once again! Now onto Good Dinosaur once that comes out in November, eh? I agree. I love that message and feel it should have been nominated over Despicable Me 2. The Scare Games start to lose me a bit but I really enjoy the film. Agreed! Oh, and another thing! I thought the voice cast was great as well, whether if be Billy Crystal, John Goodman, Helen Mirren, you name it! By the way, did you know that Helen Mirren also voiced characters such as a lioness in a live-action BBC film called Pride, the queen in Prince of Egypt, and Nyra in Legend of the Guardians: The Owls Of Ga’Hoole to name a few? There may have been more, but those are all that I know for now. Oh, and of course we can’t forget that John Goodman also did quite a few voice roles as well, whether that be in here, Princess & The Frog, here, Monsters, Inc., Jungle Book 2, Emperor’s New Groove, and possibly others as well. Yes, she sure is. By the way, have you seen either he BBC film Pride or Legend Of The Guardians: The Owls of Ga’Hoole? I havent. Are you fan? Yes, I think you can say that, especially for the latter. By the way, you kind if I ask how come you have a clip from Toy Stiey 3 in this review? That’s strange. I don’t have any clips in this review just still images, so I’m not sure what you are seeing? I actually like this movie quite a bit. I love the message it sends about things being more than just hard work. I’ve always felt strongly that you need to work hard but also be realistic about things. My husband is always trying to convince me that I should be trying to win the races I run, but I explain to him that I just wasn’t built to be that fast. I work really hard at running and I love it, but I know I’ll never be winning any races just because. But back to the movie, I do agree that the challenges and all that get to be a little bit much. Very well said. I agree about the message of hard work doesn’t always equal success. What a bold message for a children’s film.